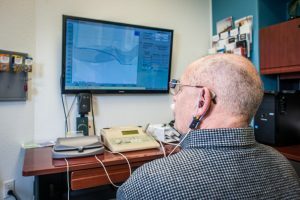 Studies have shown that people have much better speech understanding in noisy places when their hearing aids have been programmed using a tool known as Real Ear measures. Specifically, Real Ear measures involves placing a measuring microphone near the individual’s eardrum, putting the hearing aid over the top of the measuring device and calculating how much hearing is improved by the hearing aid while it is being worn by the individual. We have used this system to fit every hearing aid we have programmed for more than 20 years because we believe that it is the only way to ensure that your hearing aid program matches your hearing loss. We won an international award for our research on how hearing aids should be programmed to improve your speech understanding.